A view of the Bavarian retreat of Schloss Elmau, where leaders of the Group of Seven (G7) countries will gather for their annual summit on June 7–8, 2015. 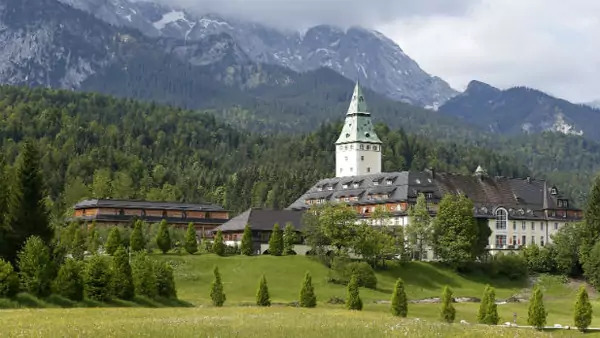 When President Obama and his fellow Group of Seven (G7) leaders convene this weekend at the Bavarian retreat of Schloss Elmau, they will face two tasks. The most obvious is to formulate common positions on a global agenda so sweeping that it will strain even the lengthiest communiqué. Their more subtle challenge is to signal that their advanced market democracies remain not only an anchor of order in a turbulent world but also a potential engine to drive global governance reform. The reconstitution of the G7 last year coincided with a proliferation of global crises, from the Russian seizure of Crimea and the advent of the Islamic State to the Ebola outbreak in West Africa and heightened tensions in the South and East China Seas. Meanwhile, the rise of new powers and alternative groupings, such as the Group of Twenty (G20) and the BRICS, has threatened the G7 with irrelevance. Given these trends, G7 leaders must recognize that they cannot solve the world’s most pressing challenges alone. However, as a coalition of leading industrialized democracies, the G7 does play an unparalleled role as a global agenda-setter, convener, standard-bearer, and champion of the rules and norms underpinning world order. In this context, the Elmau summit will test the G7’s ability to balance what German Chancellor Angela Merkel has deemed “crisis diplomacy” with the longer-term challenges that will shape the twenty-first century. Four issues in particular bear watching at this summit. Tackling Global Growth: Economic issues will be at the forefront of the G7 summit—just as they were in 1975, when the leaders of what were then six advanced industrial democracies met for their first annual meeting at Chateau Rambouillet in France. But a lot has changed in the past forty years, particularly on the economic front. Today’s G7 nations represent only one-third of global GDP—a sizeable share, to be sure, but dwarfed by the G20’s 85 percent. Indeed, some of the most important engines of global growth are—and for the foreseeable future will be—non-G7 members, such as China, India, and Brazil. This explains, in part, why the G20 is now considered the world’s premier forum for global economic coordination. As if to underscore the G7’s economic vulnerability, the possibility of a Greek exit—or “Grexit”—from the eurozone has dominated news coverage of the upcoming summit, even though it is not on the official agenda. Merkel, for her part, is determined to prevent the Greek debt crisis from overshadowing the event, which she views as a golden opportunity to demonstrate the G7’s continued relevance and make headway on equally pressing challenges like poverty and global warming. Supporting Sustainable Development and Combating Climate Change: The Elmau summit offers a chance to build momentum behind three major UN gatherings during the second half of 2015: the Financing for Development summit in Addis Ababa in July, the launch of the Sustainable Development Goals in New York in September, and the twenty-first Conference of Parties to the UN Framework Convention on Climate Change (UNFCCC) in Paris in November and December. The G7 nations will also showcase new climate change initiatives, with an eye toward the Paris conference. On May 7, the German government announced the G7 initiative on Climate Risk insurance, which aims to increase the resilience of developing countries against climate-induced (and other natural) disasters. Another promising development was the agreement [PDF] by G7 energy ministers on May 12 that all the G7 countries’ initiatives should support a global climate treaty. Meanwhile, a coalition of 120 business leaders has sent an open letter [PDF] to the G7 finance ministers, urging them to support a long-term global emissions reduction goal in the Paris agreement and submit short- to medium-term national emissions pledges and country-level action plans. Strengthening Maritime Security: One of the novel additions to this year’s agenda (if incongruous in the alpine setting) will be maritime security. In April, G7 foreign ministers adopted a Declaration on Maritime Security outlining their concerns regarding the territorial disputes in the South and East China Seas; the problem of illegal, unreported, and unregulated fishing; piracy and human trafficking at sea; and the conservation of marine biodiversity. Although the declaration does not explicitly refer to China by name, there is no doubt about its primary target. Reportedly, Japan had appealed to its partners in the G7 to take a stronger stance on China’s maritime assertiveness—and the document drew the ire of some in the Chinese media for its condemnation of “unilateral actions, such as large scale land reclamation,” and its opposition to “any attempt to assert territorial or maritime claims through the use of intimidation, coercion or force.” Like last year’s decision to eject the Russia, this development suggests that the G7 could be returning to its Cold War roots as a vehicle to defend the Western liberal order against potential geopolitical adversaries. Bolstering Global Health: Finally, Merkel has emerged as an eloquent advocate for reforming the World Health Organization (WHO), most recently delivering a powerful speech at the opening of the World Health Assembly last month. At Schloss Elmau, the G7 will pick up the three issues that she raised in that address: distilling lessons from the Ebola epidemic; combating poverty-related neglected tropical diseases; and tackling increased antibiotic resistance. Merkel has affirmed that the world needs a strong WHO, but she also understands that other actors—e.g., the private sector, public-private partnerships, and NGOs—play an increasingly vital role in protecting global health security. Given the financial resources and technical expertise at its disposal, the G7 is uniquely positioned to mobilize and maintain global support for outbreak preparedness and scientific research and development. Inherent in Merkel’s summit agenda is a paradox: the G7 is taking up a growing number of challenges that are global in scale, and yet it remains an exclusive club of advanced democracies. From economics and health to maritime security and climate change, all of the issues to be discussed at the summit are beyond the capacity of the G7 to resolve. What the G7 does provide is a platform to rally support for more comprehensive global efforts. The G7 cannot meet these challenges alone; we will need many other partners. Nevertheless, I am convinced that the G7 can be, indeed must be, the driving force for a world worth living in, in the long term. … That is the value-added that can be expected from G7 summits. And that is the standard against which we should measure our actions. The G7 retains enormous symbolic value as a likeminded coalition of market democracies dedicated to the international rule of law. But to remain relevant, it must leverage its diplomatic clout and unmatched resources to drive reform in other global bodies. And indeed, this is the summit’s greatest opportunity for breakthrough. For the G7 cannot afford to become a gated retirement community in a chaotic world.